While most so-called "child safety" software programs are sold through stores, ComputerCOP has found its way into homes across the country through law enforcement giveaways. Sheriffs, police chiefs, district attorneys, and other officials have purchased the software in bulk and distributed it to the public as part of their outreach initiatives. But ComputerCOP may actually may make your family's data less safe. You can read all about that, and some of the misleading ways the product has been marketed, in our in-depth investigative report, available here. We have identified more than 245 agencies that have distributed ComputerCOP over the last 10 years. The list is based primarily on a map that appears on ComputerCOP's own website, which we attempted to verify one-by-one through news articles, press releases and other online public records. We also added a few that we found that weren't on the map. In most cases, details were scant online, but whenever possible we include the information about year the software was purchased, how much was spent and how many copies were purchased. Not all versions of ComputerCOP contain the keylogger, but we note whenever we were able to verify for sure that the software contained that feature. In many cases, ComputerCOP listed agencies on its map that we we were unable to independently verify through online records searches. Those are noted accordingly. This list will be updated with each new distribution of ComputerCOP we discover. U.S. Marshals - Under Director John Clark, the U.S. Marshals promoted ComputerCOP and authorized the company as part of its Gang Resistance Education and Training (GREAT) program. Source. Source. Elmore County Sheriff's Office - In December 2013, Elmore County Sheriff Bill Franklin announced plans to purchase 1,000 ComputerCOP discs with asset forfeiture money and distribute them for free to families in 2014. Source. Limestone County Sheriff's Office - In September 2014, Sheriff Mike Blakely's office began distributing ComputerCOP using asset forfeiture money. Source. Further agencies listed on ComputerCOP's map: Montgomery County Sheriff's Office. Alaska Department of Public Safety - In 2011, DPS spent $50,000 to distribute ComputerCOP "to every school, public library and police agency in Alaska." Source. Source. Maricopa County Attorney's Office - In 2013, Maricopa County Attorney Bill Montgomery spent $25,000 for 5,000 copies of ComputerCOP. Source. Source. Source. Nogales Police Department - In 2014, Nogales police spent $5,000 on 1,050 copies of ComputerCOP. Source. Further agencies listed on ComputerCOP's map: Benton County Sheriff's Office, Benton County Prosecuting Attorney's Office, Stone County. 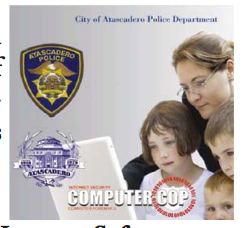 Atascadero Police Department - In 2007, Atascadero cops distributed ComputerCOP for free at a "Youth Internet Safety" forum. Source. Source. Contra Costa District Attorney's Office - In 2014, District Attorney Mark Peterson bought 500 copies of ComputerCOP with seized assets. Source. Source. Inglewood Police Department - In 2006, Inglewood police distributed ComputerCOP for free at its annual "Public Safety Day." Source. Source. Los Angeles County District Attorney's Office - District Attorney Steve Cooley gave out 6,700 copies of ComputerCOP for free to foster and adoptive parents. The D.A. 's office also sold copies for $8.95 on its website. Source. Source. Riverside County District Attorney's Office - Riverside County District Attorney Paul Zellerbach spent $27,782 on 5,890 copies of ComputerCOP in 2011. Source. San Diego County District Attorney's Office - In 2012, San Diego D.A. Bonnie Dumanis spent $25,000 in asset forfeiture funds on 5,000 copies of ComputerCOP. Source. Source. Source. Update: On Oct. 1, 2014, in response to EFF's report, the San Diego District Attorney's Office issued a warning about ComputerCOP, although it stopped short of issuing a recall. Source. Source. Santa Maria Police Department - In 2006, the Santa Maria Police distributed ComputerCOP. Source. Solano County District Attorney's Office - In 2006, Solano County D.A. David Paulson sold ComputerCOP on the office's website for $5 a copy, then later distributed it for free. Source. Source. Ventura County District Attorney's Office - In 2006, District Attorney Greg Totten purchased 3,300 copies, of which they gave 1,000 away and sold the rest to the public for $5.40 each. This version did not include the keylogger. Source. Source. Further agencies listed on ComputerCOP's map: Monterey County District Attorney's Office, Hemet Police Department, Northern California Computer Crimes Task Force, San Jose Police Department, Sisikyou County District Attorney's Office, California Polytechnic State University. Douglas County Sheriff's Office - In 2010, Sheriff David Weaver distributed copies for free to parents and community groups. Source. Source. 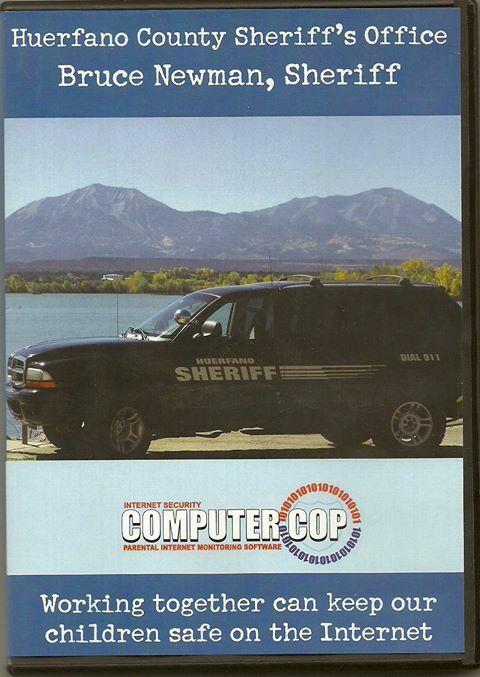 Fort Collins Police Department - According to a 2007 purchase order, the Fort Collins police bought 1,000 copies of ComputerCOP for $4,295. Source. Huerfano County Sheriff's Department - In 2013, Huerfano County Sheriff Bruce Newman was distributing ComputerCOP for free to families. Source. Littleton Police Department - In 2006, Littleton police gave out ComputerCOP for free, along with mouse pads with messages warning children of the dangers of the Internet. Source. Further agencies listed on ComputerCOP's map: Canon City Police Department, Cherry Creek School District, Colorado Regional Computer Forensic Laboratory. Danbury Police Department - In 2004, Danbury police distributed 150 copies with a video message from the mayor. Source. Source. Glastonbury Police Department - Glastonbury police distributed ComputerCOP in 2008, then again in 2011 with the help of private donor. Source. Source. Further agencies listed on ComputerCOP's map: Law Enforcement Council, Mashantucket Pequot Police Department. Brevard County Sheriff's Office - In 2009, Sheriff Jack Parker spent $22,780 on ComputerCOP. Source. Source. 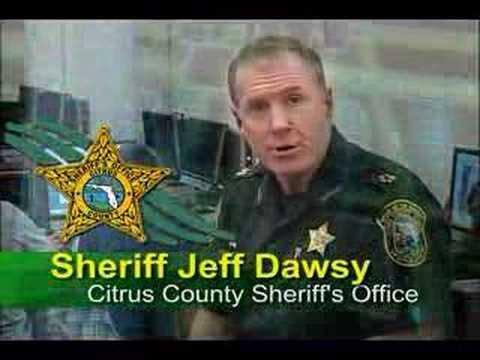 Citrus County Sheriff's Office - In 2008, Sheriff Jeff Dawsy distributed ComputerCOP for free. In 2010, the agency purchased at least $12,500 more worth of the product. Source. Source. Source. Clay County Sheriff's Office - In 2009, the sheriff's office spent $5,700 on ComputerCOP. Source. DeSoto County Sheriff's Office - As of 2014, Sheriff William Wise was distributing free ComputerCOP discs on the department's website. Source. Flagler County Sheriff's Office - In 2010, Sheriff Don Fleming purchased 3,000 copies with roughly $10,000 in asset forfeiture money. Source. Source. Source. Hendry County Sheriff's Office - Sheriff Ronnie Lee distributed ComputerCOP for free in 2008. Source. Highlands County Sheriff's Office - In 2008, Sheriff Susan Benton used $42,500 in drug seizure money to buy 10,000 copies, one for every family with a school-age child in the county. Source. Source. Hillsborough County Sheriff's Department - The sheriff's office spent $25,004 on ComputerCOP software in 2011. Source. Lake County Sheriff's Office - The sheriff's office paid $5,000 for ComputerCOP software in 2012. Source. Manatee County Sheriff's Office - According to its 2013-2015 strategic plan, the sheriff's office distributes ComputerCOP for free at the county fair. Source. Source. Martin County Sheriff's Office - In 2008, Sheriff Robert Crowder distributed copies of ComputerCOP, with the keylogger. Source. Source. Miami-Dade County Schools Police Department - The school district's police department distributed ComputerCOP as part of the U.S. Marshall's G.R.E.A.T. program. The Miami-Dade edition is also available on eBay for as little as $0.99. Source. Palm Beach County Sheriff's Office - The sheriff's office distributed ComputerCOP for free in 2008. Source. Source. Pinellas County Sheriff's Office - In 2015, Sheriff Bob Gualtieri began distributing ComputerCOP for free. Source. Source. Polk County Sheriff's Office - In 2007 and 2008, Sheriff Grady Judd distributed ComputerCOP for free. As of January 2015, the sheriff "no longer purchases nor disseminates the software." A video of Judd promoting the software has been deleted from YouTube. Source. Video. Sarasota County Sheriff's Office - Sheriff Tom Knight's website currently offers ComputerCOP, with keylogger. Source. Source. St. Lucie County Sheriff's Office - In 2008, Sheriff Ken Mascara purchased 5,000 copies of ComputerCOP, with the keylogger, using asset forfeiture funds. Source. Source. Video. 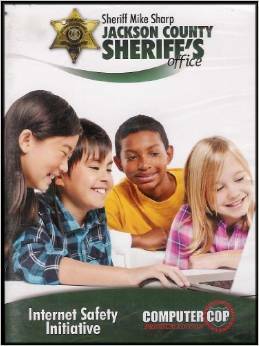 Sumter County Sheriff's Office - In 2011, Sheriff Bill Farmer teamed up with the Sumter County School Board to distribute the software for free to parents of middle school and high school students. Source. Source. Tequesta Police Department - In 2011, Tequesta police distributed ComputerCOP for free. Source. Walton County Sheriff's Office - In 2008, the sheriff's office distributed ComputerCOP for free. Source. Further agencies listed on ComputerCOP's map: Dade County Sheriff's Office, Davie Police Department, Escambia County Sheriff's Office, Florida School for the Deaf & Blind, Franklin County Sheriff's Office, Hamilton County Sheriff's Office, Hollywood Police Department, Jacksonville County Sheriff's Office, Longwood Police Department, Osceola County Sheriff's Office. Chatham County Sheriff's Office - In 2008, the sheriff's office distributed 2,500 copies for free to families. Source. Source. Coweta County Sheriff's Office - In 2008, Sheriff Mike Yeager distributed 2,500 copies of ComputerCOP, with the keylogger. Source. Dunwoody Police Department - In 2014, Dunwoody police distributed ComputerCOP, with the keylogger, at free "Cyber Safety" classes. Source. Paulding County Sheriff's Office - In 2012, Sheriff Gary Gulledge began distributing ComputerCOP. It was paid for with a federal grant administrated by the Georgia Bureau of Investigation. Source. Source. Further agencies listed on ComputerCOP's map: Alpharetta Police Department, Cobb County Police Department, Warner Robins Police Department. Channahon Police Department - In 2009, the Channahon police purchased 5,000 copies of ComputerCOP for $5,060. Officers distribute the software to parents for free. Source. Cook County State's Attorney's Office - Cook County State's Attorney Anita Alvarez began offering ComputerCOP to Chicago parents for free in November 2013. Source. Source. Grundy County Sheriff's Office - In 2010, the sheriff's office spent $5,600 on ComputerCOP software to distribute to parents for free. Source. Source. Source. 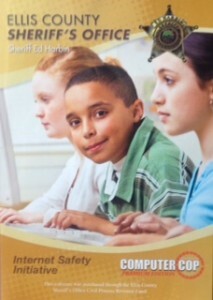 Kane County Regional Office of Education - In 2004, education officials bought 5,000 copies of the software to sell to parents at-cost, or $3 per CD-Rom. Source. Further agencies listed on ComputerCOP's map: Oswego Police Department, Lyons Police Department, Kane County Sheriff's Office, Kendall County Sheriff's Office, Wayne County Sheriff's Office. Floyd County Sheriff's Office and Floyd County Prosecutor's Office - In 2010, County Prosecutor Keith Henderson and Sheriff Darrell Mills teamed up to distribute ComputerCOP. Source. Marion County Prosecutor's Office - In 2007, County Prosecutor Carl Brizzi distributed 11,000 copies of ComputerCOP through libraries. Source. Source. Source. Further agencies listed on ComputerCOP's map: Indianapolis Metropolitan Police Department. Warren County Sheriff's Office - In 2010, Warren County spent $1,533 on ComputerCOP. Source. Anderson County Sheriff's Office - In 2012, Sheriff Jeff Hupp distributed ComputerCOP for free to parents. Source. Brown County Sheriff's Office - The Brown County Sheriff loans out the software from various libraries and police substations and sells them for $8 per disc. Source. Ellis County Sheriff’s Office - In 2013, Sheriff Ed Harbin purchased 500 copies for $3,000 for distribution to the public for free. Source. Source. Source. Source. Jackson County Sheriff's Office - In 2013, Sheriff Tim Morse distributed copies of ComputerCOP, with keylogger, to parents for free. Source. Norton County Sheriff's Office - The Norton County Commission authorized Sheriff Troy Thomson to buy $4,250 worth of ComputerCOP CDs, which the county then sold to the public. Source. Pottawatomie County Sheriff’s Office - The sheriff's office presented copies of ComputerCOP at a Parent Teacher Organization meeting in 2008. Source. Saline County Sheriff's Office - Sheriff Glen Kochanowski began selling ComputerCOP for $5 per disk in 2007, but gave away 480 discs for free in 2010. Source. Source. Thomas County Attorney's Office - In 2007, County Attorney Andrea Wyrick used seized assets to purchase copies of ComputerCOP to distribute to the public. Source. Further agencies listed on ComputerCOP's map: Ford County Sheriff's Office, Lenexa Police Department, Sedgewick County Sheriff's Office, and the Wichita Police Department. Taylor County Sheriff's Office - In 2013, Sheriff Steve Newton bought 1,000 copies of ComputerCOP, with the keylogger program, to distribute to the public for free. Source. Source. Agency listed on ComputerCOP's map: Louisiana Attorney General's Office. Brockton Police Department - Between 2003 and 2007, Brockton police handed out free copies of ComputerCOP at "Internet Safety Nights" at local schools. Source. Source. Foxborough Police Department - In 2004, Foxborough police gave out free copies of ComputerCOP to parents. Source. Suffolk County District Attorney's Office - Since 2010, Suffolk County D.A. Daniel Conley has offered free copies of ComputerCOP, with keylogger, as part of the office's Internet safety initiatives. Source. Source. Source. Source. 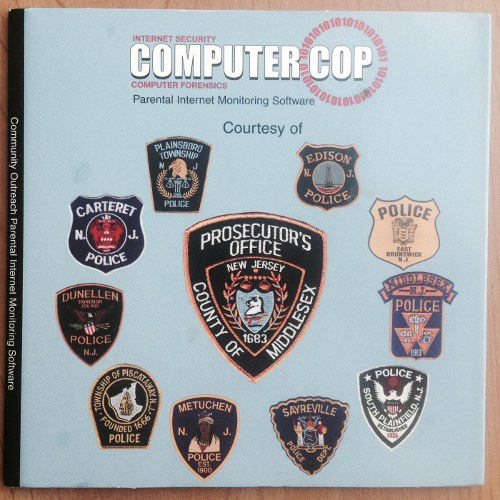 Weymouth Police Department - In 2007, a Weymouth police officer handed out free copies of ComputerCOP to everyone in attendance at a Catholic elementary school's Parent Teacher Organization meeting. Source. Further agencies listed on ComputerCOP's map: Essex County District Attorney's Office, Peabody Police Department. Dearborn Police Department - In 2010, Dearborn police offered a basic version of ComputerCOP to parents for free, while encouraging them to purchase the $40 version, of which $10 went to the department. Source. 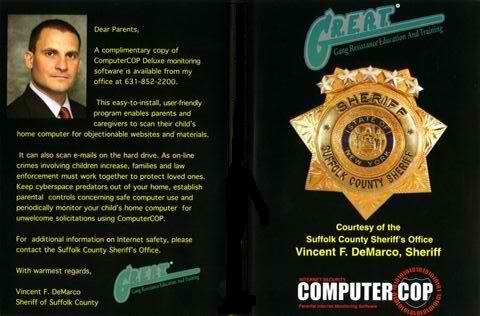 Midland County Sheriff's Office - In 2012, Sheriff Jerry Nielsen distributed copies of ComputerCOP to families for free. Source. Source. Roseville Police Department - In 2011, Roseville police distributed ComputerCOP, with the keylogger, to parents. Source. Source. Southfield Police Department - In 2004, Southfield police purchased 2,000 copies of the ComputerCOP basic CD-ROM for $5,700. Source. Sterling Heights Police Department - In 2004, SHPD offered ComputerCOP software to parents at a $1 charge. Source. Wayne County Sheriff's Office - Sheriff Benny Napoleon distributed 9,000 copies of ComputerCOP. Source. Wyoming Police Department - In 2011, the police department's Community Service Unit distributed ComputerCOP to families. Source. Further agencies listed on ComputerCOP's map: Waterford Township, Monroe County Sheriff's Office, Wayne Police Department. Agencies listed on ComputerCOP's map: Waite Park Police Department, Roseville Police Department. Greene County Sheriff's Office - In 2011, Sheriff Jim Arnott purchased 3,000 copies of ComputerCOP at a cost of $8,000 (although some reports say it was $15,000). As recently as this year, the sheriff's office was still distributing the software at child safety events. Source. Source. Source. Source. Jackson County Sheriff's Office - Sheriff Mike Sharp used seized assets to purchase 5,000 copies of ComputerCOP, with keylogger, which he distributed to families who attended a 15-minute training in 2011 and 2012. Source. Source. Lee's Summit Police Department - In 2011 and 2012, Lee's Summit police distributed ComputerCOP at its "Love and Logic" training events for parents. Source. Source. Source. Lorain County Sheriff's Department - In 2009, the Sheriff spent $1,080 on ComputerCOP software. Source. Nixa Police Department - In 2012, the Nixa police department distributed ComputerCOP software that it purchased with grants from local banks. Source. Source. Source. Source. Rogersville Mayor's Child Safety Task Force - In 2006, Rogersville Mayor Jack Cole spent $12,000 on ComputerCOP, which was offered to parents for free at city hall. Source. Source. Stone County Sheriff's Office - In 2012, Sheriff Richard Hill bought 1,250 copies using money from "a discretionary account utilizing fees collected from serving civil papers." Source. Further agencies listed on ComputerCOP's map: Jefferson City Police Department, Clay County Sheriff's Office. Flathead County Sheriff's Office - In 2010, Sheriff Mike Meehan spent $8,250 on ComputerCOP software, which he later used as one of his top career accomplishments during his reelection campaign that same year. He lost. The next year, his successor, Sheriff Chuck Curry, bought $5,950 worth of ComputerCOP software. Source. Source. Source. Source. Gage County - Through a cross-agency partnership, 1,000 copies of ComputerCOP were distributed by the Gage County Sheriff's Department and the Beatrice and the Wymore police departments in 2012. Source. Omaha Police Department - Using grant money from the U.S. Marshals, Omaha police purchased 5,000 copies to distribute to parents of local schoolchildren in 2009. Video. Source. Source. Otoe County - Partners for Otoe County, a non-profit, purchased ComputerCOP software for distribution through a federal grant in 2013. Other groups involved in the project included the Otoe County Attorney’s Office, Otoe County Sheriff's Office, Nebraska City Police Department, and St. Mary’s Community Hospital. Source. South Central Area Law Enforcement Services (SCALES) - In 2010, these 11 agencies lent out 1,000 copies of ComputerCOP: Hall County Sheriff's Office, Grand Island Police Department, Adams County Sheriff's Office, Hastings Police Department, Kearney Police Department, Buffalo County Sheriff's Office, Dawson County Sheriff's Office, Holdrege Police Department, Phelps County Sheriff's Office, Aurora Police Department, Nebraska State Patrol. Source. Further agencies listed on ComputerCOP's map: Cass County Sheriff's Office, Nemaha County, Jefferson County. Ralston Police Department - According to city council meeting minutes from 2010, Ralston police spent $2,000 on ComputerCOP. Washoe County Sheriff's Office - In 2005, ComputerCOP was part of the sheriff's Internet Crimes Against Children Task Force's program. Source. Further agencies listed on ComputerCOP's map: York County. The map also indicated ComputerCOP had been distributed in "Mead County," Nevada, but no such place exists. Agency listed on ComputerCOP's map: Milford Police Department. 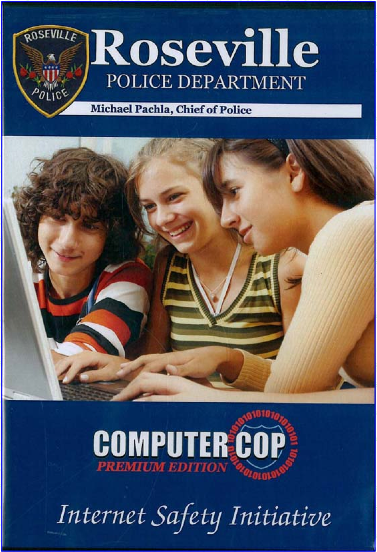 In 2003, the following agencies partnered up to distribute 12,000 copies of ComputerCOP, which included the keylogging feature: Middlesex County Prosecutor's Office, Plainsboro Police Department, Carteret Police Department, Dunellen Police Department, Piscataway Police Department, Metuchen Police Department, Sayreville Police Department, South Plainfield Police Department, Middlesex Police Department, East Brunswick Police Department, and Edison Police Department. Source. Holmdel Police Department - In 2002, the Holmdel police distributed ComputerCOP for free to parents. Source. Ocean County Prosecutor's Office - In 2005, the prosecutor's office spent $4,000 on ComputerCOP software. Source. Passaic County Sheriff's Office - In 2012, Sheriff Richard Berdnik distributed copies of ComputerCOP to parents. Source. Source. Salem County Sheriff's Office - In 2013, Sheriff Charles Miller distributed copies of ComputerCop to parents. Source. 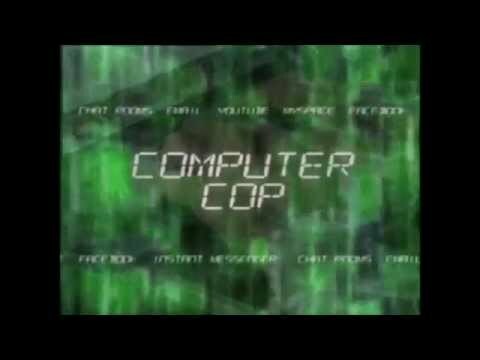 Westfield Police Department - In 2003, the Westfield Police Department's Community Police Bureau sold copies of ComputerCOP to families for $10 a piece. Source. Further agencies listed on ComputerCOP's map: Eastampton Township Police Department, South Brunswick Police Department, Mercer County Sheriff's Office, Little Egg Harbor School District. Altamont Police Department - In 2008, the Altamont Police Department used $2,200 in grant money from Walmart to purchase copies of ComputerCOP. Source. Suffolk County Sheriff's Office - ComputerCOP is based in Suffolk County, where local agencies have been especially interested in purchasing the software since at least 2001. Current Sheriff Vincent Demarco has distributed more 43,000 copies of ComputerCOP to families since 2007, a fact he emphasizes in his reelection materials. 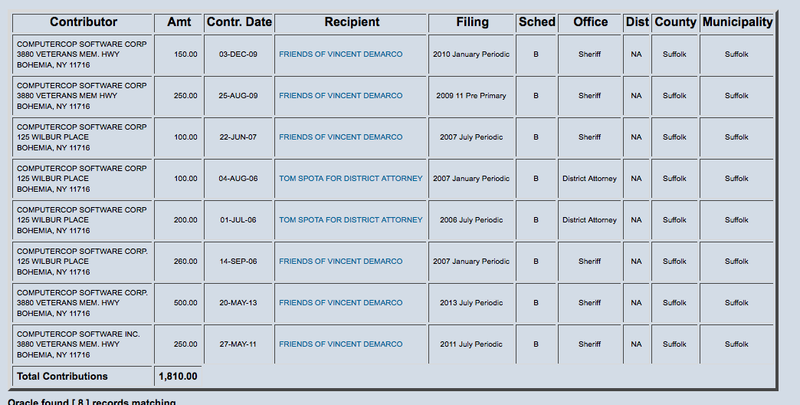 Meanwhile, ComputerCOP has donated to his political campaign at least nine times over roughly the same period. Source. Source. Further agencies listed on ComputerCOP's map: Bronx County District Attorney's Office, Nassau County Police Department, Nesconset Fire Department, Johnson City Police Department, Assemblyman Joseph Saladino, S.C.O.P.E., Coalition Against Child Abuse & Neglect, Orangetown Police Department. 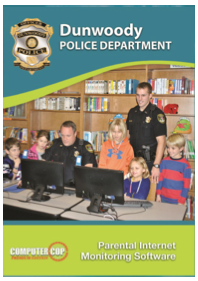 Greenville Police Department - In 2011, Greenville police distributed ComputerCOP, with keylogger, for free to parents as part of its "Internet Safety Initiative." Source. New Hanover County/Wilmington Police Department - In 2006, Wilmington Police Chief Ralph Evangelous, New Hanover County Sheriff Sid Causey, and District Attorney Ben David handed out 200 copies of ComputerCOP at a PTA banquet. Source. Pender County - Starting in 2007, Pender County District Attorney Ben David and Sheriff Carson Smith began distributing $5,000 worth of ComputerCOP. Source. Source. Source. Further agencies listed on ComputerCOP's map: Duplin County Sheriff's Office, Forsyth County Sheriff's Office, Burgaw Police Department, Surf City Police Department, Topsail Police Department. Akron Police Department/Summit County Sheriff's Office - The two agencies distributed ComputerCOP software in 2009 at seminars that were part of their "Operation Spring Cleaning" outreach efforts. Source. Cuyahoga County Prosecutor's Office - In 2010 Prosecutor Bill Mason was distributing ComputerCOP. Source. Video. Lebanon Police Department - Police distributed ComputerCOP to parents. Source. Lorain County Sheriff's Office - In 2009, Lorain County approved $1,080 for ComputerCOP software. In 2012, the county approved Sheriff Phil Stammitti to spend $20,000 in funds for the software, including the keylogger. Source. Source. Summit County Prosecutor's Office - In 2008, Prosecutor Sherri Bevan Walsh gave out copies of ComputerCOP, which included the keylogger. Source. Wayne County Juvenile Court - Juvenile and Probate Court Judge Ray Leisy distributed 20 copies of ComputerCOP at a seminar in 2009. Source. Further agencies listed on ComputerCOP's map: Summit County Juvenile Court, Union County Sheriff's Office, Upper Arlington Police Department, Westerville Police Department. West Linn Police Department - West Linn police distributed ComputerCOP for free in 2007. Source. Source. Agencies listed on ComputerCOP's map: Scranton Police Department, Allegheny County District Attorney, Delaware County District Attorney, Abington Township Police, Victims Assistance Center. Agency listed on ComputerCOP's map: Washington County Internet Crimes Against Children Task Force. Aiken Department Public Safety - As of June 2013, Aiken Department of Public Safety sells its own branded copies of ComputerCOP, with the keylogger, to parents for $15 a copy. Source. Anderson Police Department - Anderson police gave out 100 copies of ComputerCOP for free at an education fair in 2010. Source. Fifteenth Circuit Solicitor's Office (Horry and Georgetown counties) - Solicitor Jimmy Richardson partnered with local schools and libraries in 2013 to distribute ComputerCOP, with the keylogger. Source. Source. Source. Video. Kershaw County Sheriff's Office - In April 2014, Sheriff Jim Matthews told parents via Facebook that they should purchase ComputerCOP for $39.95. The county also purchased $6,080 worth of the software. Source. Source. Further agencies listed on ComputerCOP's map: Richland County Sheriff's Office, Georgetown County Sheriff's Office, Horry County Sheriff's Office, Lancaster County Sheriff's Office, Spartanburg County Sheriff's Office, Camden Police Department. Knoxville Police Department - In 2009, Knoxville police distributed ComputerCOP to families for free. Source. Source. Tellico Plains Police Department - In 2009, Tellico Plains police distributed ComputerCOP for free at Kmart and Walmart. Source. Elizabethton Police Department - In 2011, Elizabethton police used seized assets to purchase 1,000 copies of ComputerCOP, with keylogger, which they distributed for free to parents. Source. Aransas County Sheriff's Office - In 2011, Sheriff Bill Mills spent $1,000 on ComputerCOP. Source. 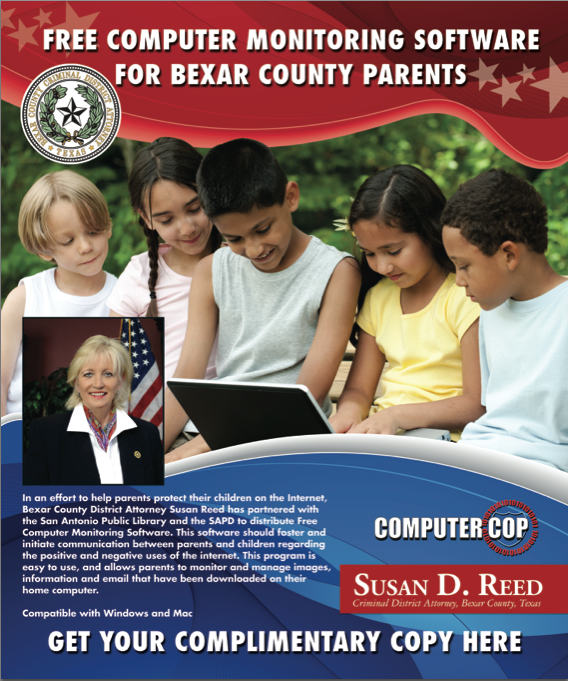 Bexar County District Attorney's Office - In 2012, District Attorney Susan Reed spent $25,000 to obtain 5,000 copies of ComputerCOP, with the keylogger, which she then distributed through police substations and public libraries. She even put a map online of all the locations where parents could obtain the software for free. Source. Source. Brazos County Sheriff's Office/Bryan Police Department - In 2005 the Brazos County deputies and Bryan police distributed ComputerCOP. Source. District Attorney’s Office for Liberty and Chambers Counties - District Attorney Mike Little distributed ComputerCOP for free in 2004. Source. Fort Bend County Sheriff's Office - In 2010, Fort Bend County appropriated $25,175 for ComputerCOP. Source. 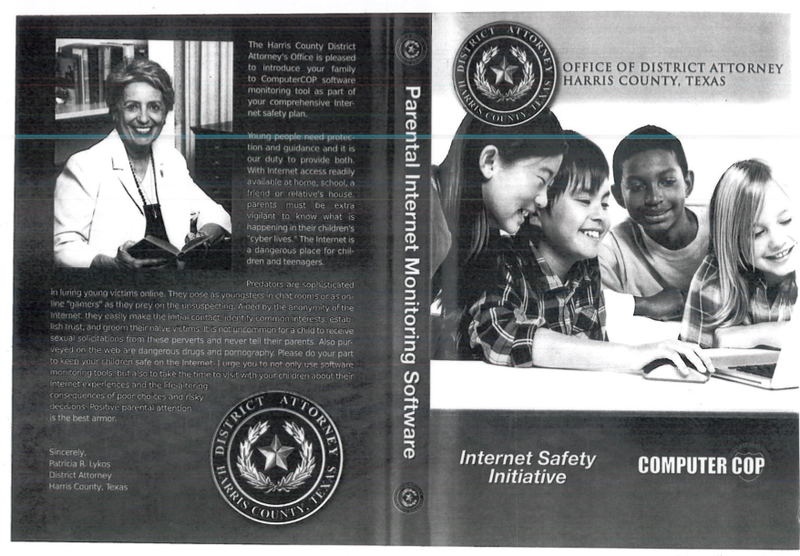 Harris County District Attorney's Office - in 2011, then-District Attorney Patricia Lykos purchased 5,000 copies of ComputerCOP, with keylogger, for $22,750. Source. Source. Smith County Sheriff's Office - In 2007, Sheriff J.B. Smith announced he was distributing ComputerCOP for free on the same day he announced his reelection campaign. In 2011, the county also used seized funds to purchase 3,000 copies worth of ComputerCOP, with the keylogger, at the suggestion of Smith County Judge Joel Baker. Source. Source. Source. Taylor County Sheriff's Office - In 2012, the Zach Robinson Memorial Foundation funded the purchase of ComputerCOP, which was promoted by County Judge Downing Bolls. Source. Travis County Sheriff's Office - In 2011, Sheriff Greg Hamilton used seized funds to purchase 5,000 copies of ComputerCOP, with keylogger. It was distributed for free from the sheriff's office and available for check out from local libraries. Source. Source. Source. Further agencies listed on ComputerCOP's map: Port Arthur Police Department, Lindsay Police Department, Midland County Sheriff's Office, Rockport Police Department. Caroline County Sheriff's Office - In 2013, Sheriff A.A. “Tony” Lippa, Jr. purchased 500 copies of ComputerCOP and distributed it for free from his headquarters and at National Night Out events in the county. Source. Fairfax County Sheriff's Office - In 2011, the sheriff's office began distributing ComputerCOP for free. Source. Fluvanna County Sheriff's Office - In 2012, Sheriff Ryant L. Washington distributed ComputerCOP for free. Source. Loudoun County Sheriff's Office - Since 2011, and as recently as 2013, Sheriff Stephen O. Simpson and his successor Sheriff Mike Champan distributed ComputerCOP, with keylogger, to families. The program is paid for with seized assets. Source. Source. Source. Source. Source. Source. Source. Lunenburg County Sheriff's Office - At the end of 2011, Sheriff Arthur Townsend partnered with local schools to purchase 1,000 copies of ComputerCOP at a cost of $4.95 apiece. That was enough for every home with a child enrolled in public schools in the county. The sheriff paid for his half of the purchase with asset forfeiture funds. Source. Tazewell County Sheriff's Office - With a $10,000 grant from a local pizza franchise president, the sheriff bought ComputerCop in 2015 to distribute to families. Source. Source. Source. 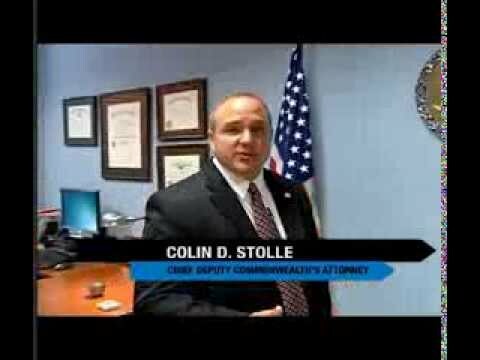 Virginia Beach Commonwealth Attorney's Office - In 2013, Commonwealth Attorney Colin Stolle spent $25,000 in seized funds to purchase 5,000 copies of ComputerCOP, with keylogger. Source. Kenosha County Sheriff's Office - In 2014, Sheriff David Beth began distributing ComputerCOP for free. As of January 2015, 1,000 copies have been distributed, with 2,000 still available. Source. Source. Source. Source. Rock County Sheriff's Office - In 2014, Rock County Sheriff Robert Spoden purchased ComputerCOP with seized funds and distributed the software through libraries. Source. Source. Source. UPDATE: On Oct. 17, 2014, Rock County issued a press release acknowledging the security flaws in the software, but that they will continue to distribute it. Source.